Stay seven nights on half board at the three-star superior Hotel Sölderhof from £839 per person based on two sharing. Price includes return flights and airport transfers. Visitwww.inghams.co.uk/ski or call 01483 791 114. Stay seven nights self-catering at the four-star Résidence Les Grandes Alpes from £599 per person based on eight sharing. Price includes return flights and airport transfers. Visitwww.inghams.co.uk/ski or call 01483 791 114. Charming Samoëns is a beautifully-preserved historic village within France’s fourth largest interlinked ski area: the Grand Massif (265km). There couldn’t be a better resort for self-catering guests, as a weekly Savoyard market sells French breads, wines and cheeses, whilst great-value restaurants offer hearty meals and boutique bakeries entice guests in for delicious delicacies. A family lift pass is available (two adults and two children aged five – 15) to pre-book through Inghams from £735, adding value to any family ski holiday. Whilst the skiing is varied and suitable for all levels, there are plenty of non-ski activities too, such as ice-skating, dog sledding, fat biking, hot air balloon rides and yoga classes. Stay seven nights self-catering at the four-star La Reine des Prés Apartments from £509 per person based on ten sharing. Price includes return flights and airport transfers. Visitwww.inghams.co.uk/ski or call 01483 791 114. Stay seven nights on half board at the four-star Hotel Gran Baitafrom £969 per person based on two sharing. Price includes return flights and airport transfers. Visit www.inghams.co.uk/ski or call01483 791 114. Stay seven nights at the three-star superior Village Club du Soleilfrom £749 per person based on two sharing. Price includes return flights, airport transfers, all meals, wine included with dinner, lift pass, ski / board and boot hire. Visit www.inghams.co.uk/ski or call01483 791 114. 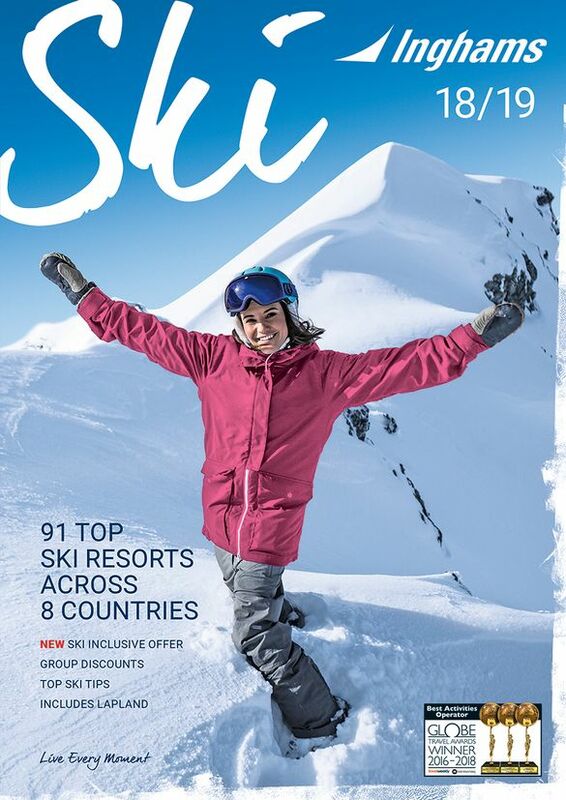 For more information, or to receive a copy of the new brochure, visitwww.inghams.co.uk/ski, or call 01483 791 114. Inghams was founded by Walter Ingham in 1934, born out of his enduring passion for ski, mountaineering and walking. In 2014, Inghams celebrated its 80th year and the brand continues to pride itself on being one of the UK’s leading, most experienced specialist tour operators, delivering a wide range of award-winning holidays to its loyal guests. Today, Inghams offers winter holidays to over 90 resorts in eight countries, with flights from 21 UK regional airports. It also has a popular Lakes & Mountains summer holiday programme to many European destinations and a dedicated Inghams Italyprogramme. For more information, visit www.inghams.co.uk.